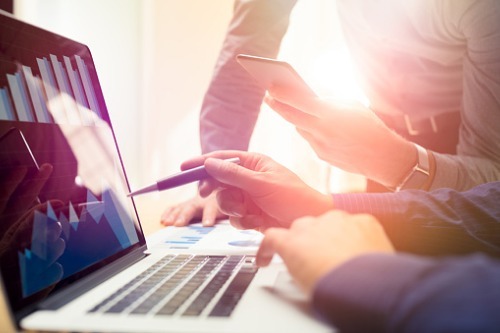 The usage-based insurance (UBI) market is expected to grow at a compound annual growth rate of more than 17% between 2018 and 2024, according to a new report by consulting firm Global Market Insights. One of the major factors driving the growth is the increased production of vehicles embedded with telematics or using external tracking systems to capture data about vehicle health and driver behavior, according to Global Market Insights. The systems allow insurance companies to calculate premiums for clients in accordance with the usage rate of the vehicle and the behavior of the driver. 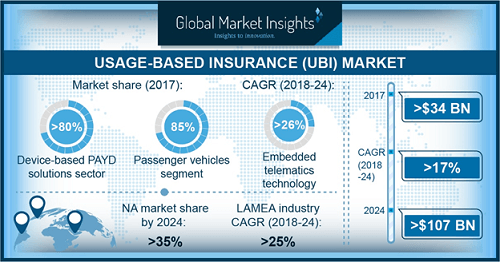 Other factors driving UBI market growth include the increasing penetration of smartphones with the ability to connect to onboard devices and increase the number of connected cars, enabling vehicles to share data with the outside environment, Global Market Insights said. The “pay how you drive” (PHYD) segment held a dominant share – more than 70% – of the UBI market in 2017, the report said. PHYD analyzes driving habits by using data recorded by telematics devices installed in vehicles and decides premiums based on those habits. This helps address unfair insurance practices and considers the habits of individual drivers to help charge fair premiums, the report said. Onboard diagnostic system (OBD II) technology also held a major share of the UBI market in 2017 and is expected to dominate the market in 2024. OBD II technology allows vehicle owners to improve vehicle reliability and reduce fleet operation costs. This, in turn, can help companies reduce their fleet insurance premiums. The commercial-vehicle segment of the UBI market is expected to register a growth rate of more than 18% from 2018 to 2024, according to Global Market Insights. The segment is widely deploying telematics to analyze vehicle and driver data. The North America UBI market is expected to hold a majority market share of more than 35% by 2024, the report said.